Free WiFi and an outdoor pool are featured at this Port Isabel motel. The beach is less than 5 minutes' walk from the property. 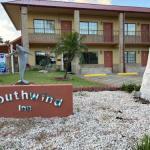 A flat-screen TV is provided in each room at Southwind Inn. The rooms also come with a full kitchenette which includes a microwave and a refrigerator. Barbecue facilities are available at Southwind Inn. Free parking is also offered. Port Isabel Light House State Historical Park is 0.5 miles from the motel. Schlitterbahn Beach Waterpark is 10 minutes' drive away.